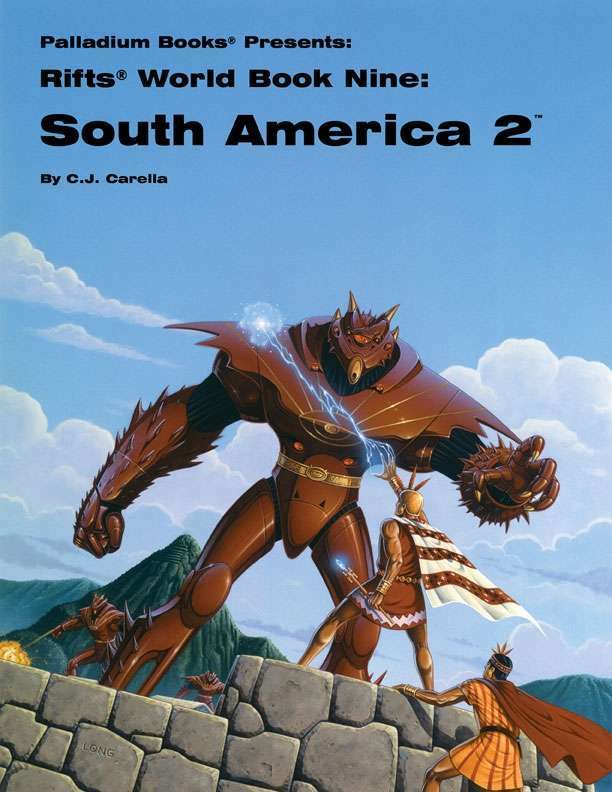 Rifts® South America is a hotbed of intrigue and conflict. There are the mysteries of the Nazca Lines (a magic, alien defense system), the return of ancient gods, alien invaders, mutants, Inca undead, trans-dimensional raiders, and more. Over 30 new O.C.C.s and R.C.C.s, including the Inca Sun-Priest, Mutant Capybara, Neo-Human and Larhold Barbarian. The Nazca line maker and line drawing magic. Larhold magic of the Blue Flame and 10 unique Blue Flame spells. The return of the Inca Empire led by the Inca gods. The Silver River Republic, conspiracies and war. The Arkhons, an alien invasion fleet that crash-landed on Earth. The Megaversal Legion, human and D-Bee mercenaries equipped with ultra-sophisticated alien technology. 192 pages by C.J. Carella. Cover by Brom.